We’d love your help. Let us know what’s wrong with this preview of Doing Good... Says Who? Stories from Volunteers, Nonprofits, Donors, and Those They Want to Help by Connie Newton & Fran Early. Based on over 400 interviews Doing Good . . . Says Who? puts the reader on the ground with volunteers, NGO staff, donors, and…uniquely…with the Guatemalan beneficiaries of their good will as cultures intersect. To ask other readers questions about Doing Good... Says Who? Stories from Volunteers, Nonprofits, Donors, and Those They Want to Help, please sign up. Before I begin this review, please know I am aware I am a white woman and because of my education I am placed in the middle-class by U.S. standards (though I wish this would leak to my bank account). My understanding of my reality easily influences what I encounter, as it does for other individuals. Thus, I know my understanding is a privileged understanding. On top of this, I research the nonprofit sector typically in regions where there is or has been violent conflict often placing me in areas Before I begin this review, please know I am aware I am a white woman and because of my education I am placed in the middle-class by U.S. standards (though I wish this would leak to my bank account). My understanding of my reality easily influences what I encounter, as it does for other individuals. Thus, I know my understanding is a privileged understanding. On top of this, I research the nonprofit sector typically in regions where there is or has been violent conflict often placing me in areas described as developing or "third world" (a term I particularly loathe). Therefore, I understand I walk a very narrow line between critique and hypocrisy. I try to walk this line honestly, but I often fail. I can only do my honest best, and I am doing my honest best with the review that follows. To be honest, I find this book to stay on the surface of colonial mentality and do-gooder condensation thereby upholding the very premise of colonial mentality and do-gooder condensation the authors seek to disrupt. I think the book takes a bold and important step in helping white people prepare for helping outside their home culture. I think with a good facilitator, who can challenge readers' understanding of what is read and ask the uncomfortable questions to unearth hidden bias, the book could be an adequate tool. However, I think reading it on one's own may, like the book itself, only scratch the surface of challenging and pursuing change in doing good. And, I agree with the authors that challenging and pursuing change needs to take place. But, let me explain my criticism eliciting lack of depth (which will come off as a screed - though I am not certain I apologize for my tone). To begin, both authors are North American and white and want to bring forward the voices of Guatemalans. That intention of bringing forward voice in and of itself is condescending and insulting. In all the years these women have worked in development, have they not encountered any native or indigenous individual - in the case of this book, Guatemalans - with whom they could collaborate, and recognize with co-authorship, to produce a book challenging do-gooder mentality? Guatemalans have voices and they use them. You do not have bring forward any voice; you have to simply extend the invitation to the "other" to participate and collaborate. So, where are the "other's" voices in this book? Despite the authors' best intentions, the voices I mostly hear underneath the scenarios are white voices. Another question: how about a Guatemalan review in the praise section at the front of the book? Nope, all reviews are white as are nearly all authors in the bibliography, raising yet another question: are there no Guatemalan development experts from which the authors could draw references? I doubt the answer is there are (indeed) none because I have been researching (and have co-authored a journal article with) native/indigenous Guatemalan nonprofit leaders. And, while we are on this white subject, it should be apparent to the authors that there is an over-representation of white people in international volunteerism and this is a reality that should be questioned, not nurtured. I would be fascinated to hear the experiences and reflections of a Native American volunteer in the Quiché region of Guatemala. Do such volunteers exist? If not, why not? If yes, where are their voices? All of the above screed is to bring into question how well do the authors practice the tenets they preach: (1) respect and value the people; (2) build trust through relationships; (3) do "with" rather than "for"; (4) ensure feedback and accountability; and (5) evaluate every step of the way. I feel they fall very short of their tenets and should be called out strongly; therefore, I conclude no apologies for my tone in this review will be forthcoming. I was blessed to meet the authors and hear them speak on this book before I ever read it as they are friends of dear friends of mine (Sandy & Helen Havens). It wasn't just the personal connection that made me want to read the book, either. Ms. Newton and Ms. Early are experienced nonprofit workers and volunteers, both of whom have spent extensive time with NGOs in Guatemala. This book is the distillation of those years of experience and is an invaluable manual for anyone who feels called to I was blessed to meet the authors and hear them speak on this book before I ever read it as they are friends of dear friends of mine (Sandy & Helen Havens). It wasn't just the personal connection that made me want to read the book, either. Ms. Newton and Ms. Early are experienced nonprofit workers and volunteers, both of whom have spent extensive time with NGOs in Guatemala. This book is the distillation of those years of experience and is an invaluable manual for anyone who feels called to work, long or short-term, on behalf of "the least of these" and wants to avoid some of the most common pitfalls. The authors have used their experience and research to weave five basic lessons in ministry into compelling stories and then detail both the lessons and their methodology. Their focus is on the ministry of accompaniment, an approach to work with populations in crisis that is gaining more and more adherents in the world of social service. Any non-profit executive who is leading such an organization, any pastor or minister who utilizes volunteers in feeding, housing, or "rescue," any youth leader taking charges on a "mission trip" needs to read this book and give it to his or her volunteers to read as well. Definitely the book to read if you are thinking of volunteering to "do good" in a developing country. The stories here were all shared by volunteers in Guatemala. My wife and I both read this book, as we are and have been involved on Boards of Directors and as volunteers at various non-profits in our community. Of particular interest to me was the strong articulation of the need to always ask and listen for the real needs and participation of those to be "served" by your efforts. "Doing Good" consistently delivers that message and I need to be consistently reminded. An excellent book by two writers with valuable years in the trenches. I was very impressed with the research backing up the content of this book. The discussion questions are phenomenal for in class as well as for content experts to have an open dialogue. I love books that make me think - and then think again. Thanks so much! A good read! I always enjoy books that encourage me to think a bit differently about a topic. 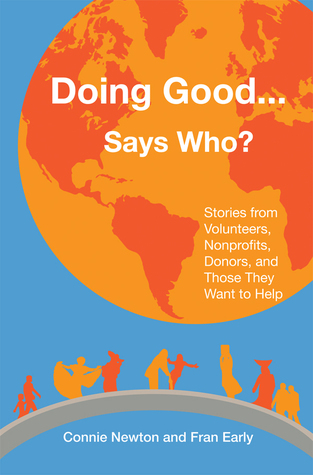 This book will certainly spark new thoughts in readers about volunteering. A must read for a person who gives money and/or time locally and globally.